Born in Kirkop on November 23, 1956, he started his career with his home town club in the lower divisions of the league. It was obvious that this youngster was going to go places. Many clubs showed interest in him but his father curbed his enthusiasm and forced him to stay and serve his apprenticeship with Kirkop United untill he had matured enough to make the grade in the top division. By 1975-76, he was ready to face challenges of first-class football and he was loaned for one season to St George's FC. It was the perfect setting for a young and aspiring footballer. St George's did not harbour any ambitions of winning honours. Nardu therefore could ply his trade in an atmosphere devoid of the pressures and heartbreakes of a team fighting for honours. Farrugia left a very good impression in his new surroundings and at the end of the season Kirkop were bombarded with offers for his transfer. Sliema, Hibernians, Floriana and Valletta wooded the youngster until his head started swimming but, fortunately for him, his father was there to help him make a decision. At the time Nardu was working in his father's lotto office in Valletta. He had many friends in Valletta and this more tha anything else tipped the balance in favour of Valletta FC. It was a good choice because the Citizens were at the time in a team building process and Nardu seemed to fit well in their plans. Nardu showed his worth from the starth. In his first season with the 'Lilywhites', he scored the all-important goal in the FA Trophy final against Floriana. The Greens were confident of victory. Their long unbeaten run made them feel invincible spurt of genius and scored the only goal of the game to take the trophy to Valletta and stop the arch-enemy's long run of successes. What better way is there to win the hearts of the City faithful? The next season Valletta went one better. They won the championship and retained the FA Trophy after beating Floriana once again in the final. Nardu celebrated that occassion by finishing in the top position of the goal-scorers chart with 16 goals. 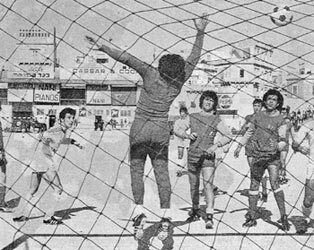 In 1979-80 Farrugia won the another league championship medal, finishing once more at the top of the goal-scorers list with 15 goals. In 1984-85, he repeated this achievement, this time with 10 goals. That season, Nardu added the Footballer of the Year award to his growing list of honours. Leonard Farrugia had a name for consistency. 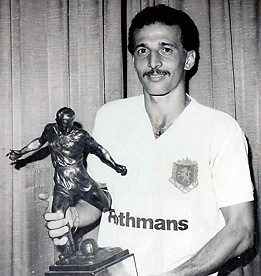 In his first 10 season s with Valletta, he missed only four league matches and between 1981 and 1986 he went through five seasons with out missing a game. The like a bolt out of the blue, disaster struck. It was January 24, 1987 and Nardu was playing for Malta against Italy at the Stadio Comunale of Bergamo. As usual Nardu was giving the Italians a hard time. 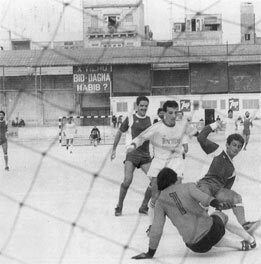 At one point in the game, Italian defender Cabrini rashly tackled him from behind and the Maltese striker went down in great pain. It was a rather rough tackle, although one must admit that it was not meant to cripple the Maltese striker. But Nardu never recovered from that serious injury. Farrugia was out of the game for the rest of the season. He was operated on in Italy by an expert in the field. Nardu tried to make a comeback in the following season in the first round match against Birkirkara but he failed the test and he had to be substituted. After that, he retired to take up coaching at youth level.